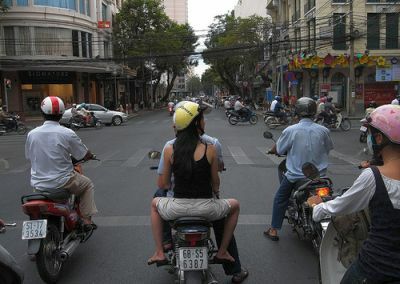 A tour of Saigon from the backseat of a motorcycle. It’s dusk in Ho Chi Minh City — or Saigon as it is still called here — and the haze of the last ounce of light from the crimson setting sun is smothered in smog as I make my way through the busy streets. The thousands of motorcycles and scooters that clog the streets of Saigon every minute of the day begin turning on their headlights, lighting up the city in an iridescent glow of traffic. I am on Pham Ngu Lao — essentially Saigon’s answer to Bangkok’s Khao San Road — in search of a place to sleep. It caters to the backpackers of Southern Vietnam, acting as a tourist information hub as well as a bus terminal. There are a wide variety of budget restaurants and trinket shops spread between dozens of ultra-discounted clothing retailers. However, a quick turn down one of the alleys off of the street reveals a much different world. These one-and-a-half-meter-wide thoroughfares shift through small neighborhoods of clustered homes with open doors, loud televisions, and even louder residents. There is an anthill of movement, babies crying, and the occasional chicken making its way across the street. The stir of Mahjong chips and smiles sets a jovial atmosphere to the otherwise intangible background static of the labyrinthine cement corridors. When the hotels along the city’s main strips of Bui Vien and Pham Ngu Lao Street fill up during the peak season, travelers often wander down these dovetailed back alleys to find a host of inviting open doors with hand-painted hotel signs. Many of them are nothing more than a family’s home where spare bedrooms are rented out for extra money when the impending tourist boom busts at the seams. I enter one of the many hotels that cater to budget backpackers looking to stretch their money. I notice a baby’s playpen — a hodgepodge of kitchen utensils and Buddha luck charms — standing opposite a small desk next to the sliding metal front door. When I’m offered a pen to write down my passport information I’m startled by the touch of oblong fingers. As the man walks behind the desk with his bowlegged hunch to grab another pen, he suddenly swings back around, revealing a right hand that is clearly connected to his bicep, lacking a forearm, elbow, or any resemblance of normally shaped fingers. He smiles back at me with his crossed eyes and I hand over the slip of numbers and letters. Agent Orange victims are reminiscent of a war that is gone but certainly not forgotten in Vietnam. Pictures of the graphic mutations resulting from this biological weapon are put on display in the Saigon War Museum and amongst some of the people. As I settle in upstairs, I smell the odor of fish sauce leaking up the smooth wooden-railed staircase into my room. Directly across the street I can see a few watching, waiting women on the corner of Bui Vien and De Tham Street. Behind them is Go2 Bar, a well-designed rock bar with a great array of local and international cuisine. The patios are often filled during the afternoon with travelers and locals alike drinking the day away. When the incessant smell of motor oil overtakes the night, it is hard not to feel the debauchery and decadence most commonly associated with Saigon’s nightlife. The infamous Apocalypse Now Club dutifully lives up to its name, however there are no cameos by Marlon Brando in this version. The club is one of Saigon’s oldest, and it hosts a variety of popular music for the revolving door of travelers that spin through the city. The blurring faces on the dance floor create an amicable ambiance, inviting to every transient looking for good music and a rowdy crowd. Be forewarned that Saigon is a hot bed of women practicing the oldest profession in the world. Foreigners are seen by many as walking ATMs, and presentation is not always made clear in the midst of the chaos of a club. Despite the range of poverty in South Vietnam, the people are still generally happy and willing to guide travelers with friendly advice. There are many personal tour guides that can be hired, including motorcycle drivers. Though slightly more expensive than the average guide, these motorized trips can offer a view of the “real Vietnam.” A walk in one of the beautiful colonial French parks surrounding Pham Ngu Lao can lead you to one of these guides if your timing is right. “Welcome to Saigon!” a small man says, greeting me as he emerges from the shadow of a tree. “You can see Saigon better on the back of a bike,” he chuckles, offering me a personalized tour. With a portfolio of pictures and signatures from travelers around the world, he introduces himself as a Saigon travel guide. For a fair price he offers tours of Saigon and the nearby attractions. As we ride down the road he translate the bright red and yellow billboards on the side of the road. “Work harder for the people,” one such sign reads. On the roads outside of Saigon, villagers toil away in passing fields donning sedge hats — the iconic conical straw hats that shield them from the midday heat. Many motorcyclists also wear them in place of a conventional helmet, despite their obvious lack of utility. We make our way to the C? Chi Tunnels, located about 45 minutes outside of Saigon, where travelers can explore the hollowed out subterranean corridors used by Vietnamese soldiers during the war. Visitors are welcome to crawl down these pitch black hideouts if they have the stomach and lack the girth. Whole kitchens, infirmaries, and infantry quarters have been made viewable from the surface for those unwilling to meander through the humid maze. My guide informs me that these particular tunnels are about twice as big as most of the original ones utilized during the war. There is also a firing range for those so inclined to let off a few rounds of archived arsenal. Later, over a hot bowl of Vietnamese Pho noodles, my guide clinks his beer with our waitress who has sat down with us to chat. She kindly gets us some more drinks and vegetables when needed while providing conversation for our dinner to slowly wind down our busy day. As the smoldering red sun sets yet again over Saigon, we buzz past the gates of Reunification Hall, the site where North Vietnamese tanks crashed through on April 30th 1975, marking the fall of city. 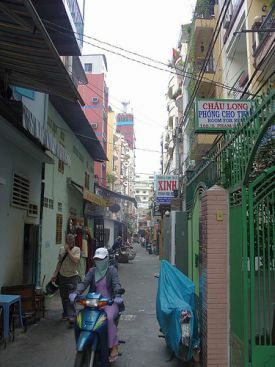 The heart of Saigon is as unmistakable as the back alleys of Pham Ngu Lao. It reminds you that, like all parts of the city, it is jovial, gritty, and welcoming if you are up for the ride.